If you are looking to download Youtube videos in bulk by playlist or channel then youtube-dl is the way to go. It is open source and runs on Linux. Mac or Windows. It can be downloaded here (or found in Debian/Ubuntu repositories). If typing commands in the terminal is not your favorite thing, then you may wish to download the GUI here. Continue reading to see what youtube-dl is capable of (the following screenshots will be showing the GUI (youtube-dlg) and will not be showing terminal commands). 2017-06-01 Update: In addition to what you will read below, the developer (?) of DLNow, a Graphical Interface (GUI) for youtube-dl, reached out to me to let me know he just released the software here: https://www.dlnowsoft.com/ It is Windows only and not free or open source (sad face), BUT, my wife who had struggled with the options below LOVES DLNow, she says it is super simple to drag and drop and great for downloading to MP3 (I have not tried it because I only use Linux, but I am happy with anything she is happy with). 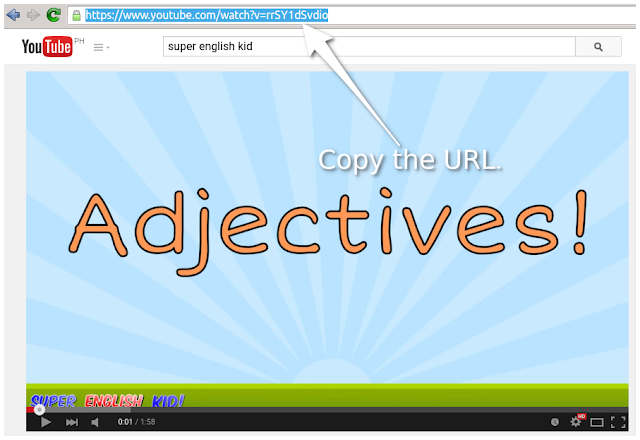 Youtube-dlg has many useful options. To get started, you can go to options and choose where you would like all of your downloads to go. While I find that the default settings work great, you can also choose from any of the myriad of video options. Or you can choose to download audio only. If you have a problem connecting or need to take a break from downloading there is even an option to start downloading from a certain video. To download only a single video, copy the URL (link address) of the video you would like to download. Paste the URL, then press the "Download" button (shown in the screenshot now as a "Stop" button because it was already downloading at the time). Downloading all the videos in a channel. When you are on the channel page, click on the "Videos" link. Copy the URL. 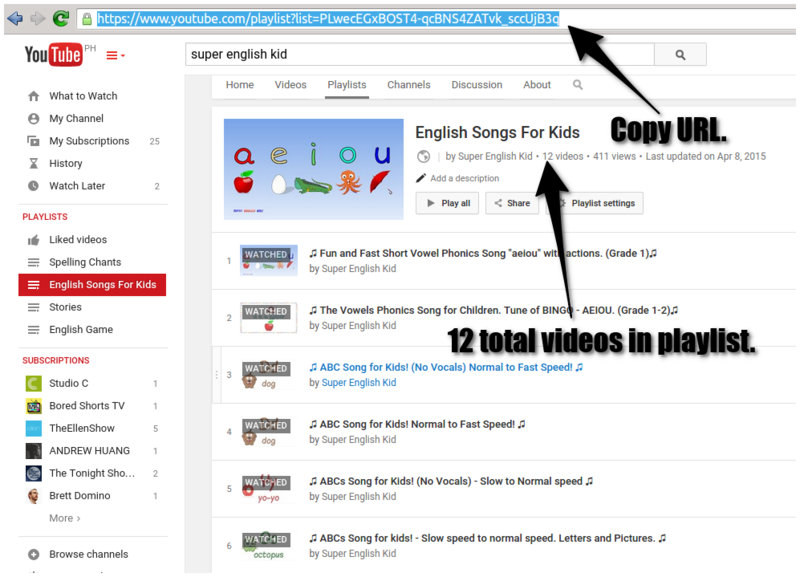 Paste the URL in youtube-dlg then press "Download." 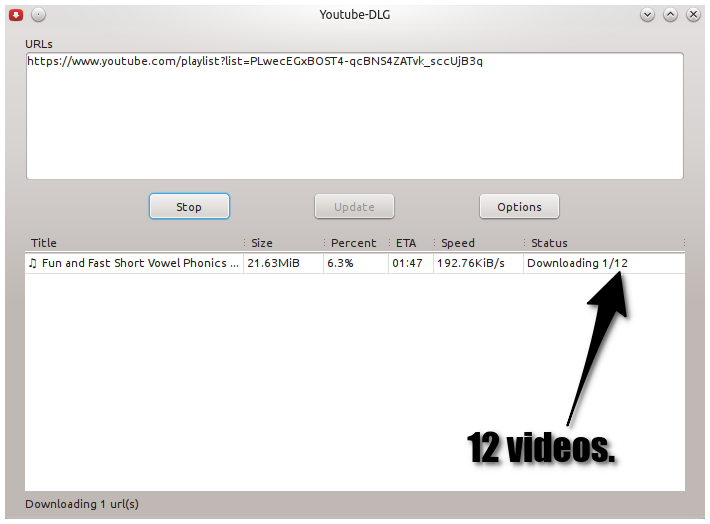 You can verify that it is working correctly by observing how many videos it is attempting to download. It should be ALL the videos in the channel. Downloading all the videos in a playlist. 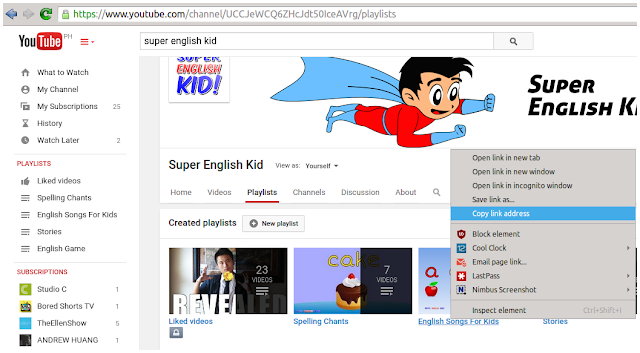 Remember, you can always right click on a video or playlist to get the link address (URL). Downloading a playlist is the same as downloading an entire channel, just make sure you select the correct link. 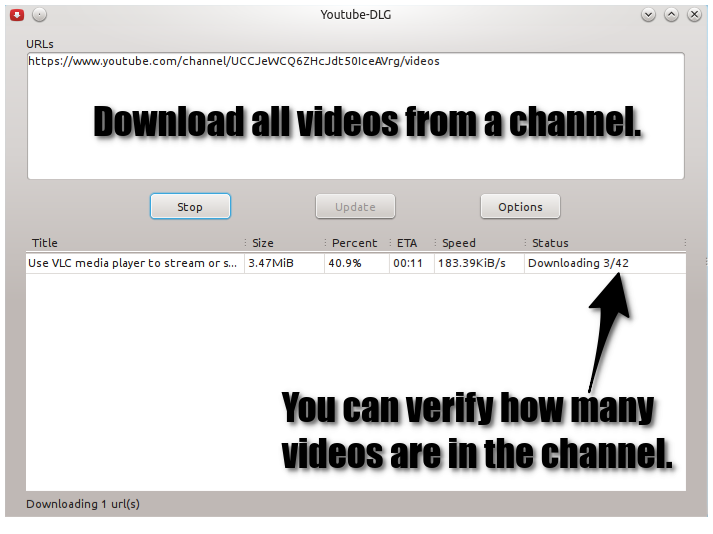 You can verify that youtube-dlg is downloading the same number of videos as there are in the playlist. If you would like to download more videos, channels, or playlists, simply add the additional links and the videos will be added to the download queue. Thank you.This is great help. So much better than all the other bloatware found online. You are very welcome. Happy that the software is working well for you. I think youtube-dl is fantastic! Is it normal or I can tweak setting to make audio work? how do i make the playlist videos numbered?